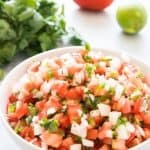 Mexican Pico de Gallo, aka Salsa Fresca, is easy to make and can be used in so many ways, from topping chicken or fish, adding to tacos, salads, and more, or just serving with chips! We even eat it at breakfast! Toss all of the ingredients together in a bowl and stir to combine. Taste and adjust salt as necessary. You could use a serrano pepper in place of the jalapeno, if you want. Store in the fridge and best within 4-5 days.